Autism is a developmental disorder of the mind, but it has a profound impact on the body as well. Children with autism can have trouble with motor function, poor coordination, myoclonal jerks, abnormal gait and posture, and sometimes difficulty sitting, lying, crawling, or walking. Autism is incredibly complex and still largely mysterious, and treatments can require a multitude of medical and behavioral interventions, from medications and educational therapies to behavioral therapies and communication therapies. But there’s another piece of the puzzle, one that can help not only with some of the physical symptoms but with behavioral problems and quality of life in general: exercise. Physical activity is important for all children, regardless of their health, but it’s especially important for autistic kids. They have higher rates of obesity than other children, for one thing, and that puts them at risk for other health conditions, from diabetes to depression. And those illnesses will only further aggravate the underlying symptoms of the autism. Physical fitness improves general motor functioning. Studies have shown that regular exercise can lead to improvements in balance, strength, agility, speed, endurance and flexibility. It also has been shown to significantly reduce negative, repetitive behaviors such as body rocking, head nodding, object tapping, and spinning. And exercise may have an effect in reducing self-injurious or aggressive behavior. Finally, regular exercise gives autistic children some of the positive social interaction they find difficult to maintain in their daily lives. This is particularly true of children who are able to participate in team sports, but it’s also true of children who require solitude, as there still may be interaction with coaches or therapists. Above all, autistic children who exercise are able to build self esteem and self confidence that may help them manage their symptoms and communicate more easily. So what’s the right exercise regimen for your autistic child? Well, that depends. It depends on your child; their symptoms and behaviors as well as strengths and deficits. Most of all, it depends on what your child enjoys! Whether it’s team sports or one-on-one yoga, don’t rule anything out right away. Some sports, like hockey, may seem too dangerous or too involved or too social, but that doesn’t mean they are. There are hockey teams in the United States made up entirely of developmentally disabled children. Whatever type of athletics you choose, do what you can to integrate it into your child’s academic and social skills studies. 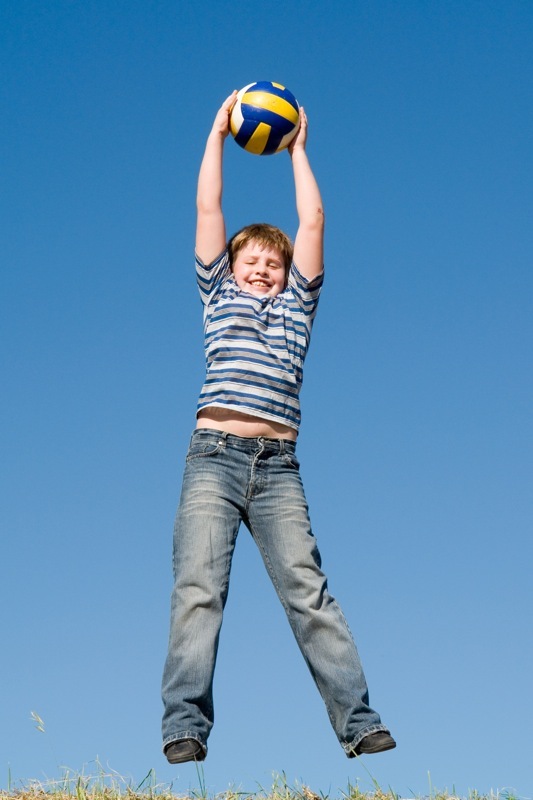 Follow your child’s exercise regimen or team sport with a study period, and follow that by a social skills period. Make sure the various teachers and therapists are in contact with each other. Integrating social, academic and physical activities will help minimize your child’s cognitive and sensory symptoms. If your child is up for a team sport, either find one that has other developmentally disabled players or place him or her on a team with players a couple of years younger. A “shadow” can help bring your child onto the team socially and athletically. Even if your child isn’t ready for a team sport, he or she can still learn some of the basics – making a goal, catching a ball, throwing into hoop. That way, if the time comes, he or she can join in a game after school or sign up for a team. Spring Fever – Time to Get the Body Moving! I am learning from my mistakes. Hey, that’s better than continuing a pattern for an indefinite amount of time, unwilling to look at what may or may not be working, right? My son, being an unschooler for a little over six months, is very much out of shape. Oh, I know the reason. He spends the better part of his day programming video games (not playing them – WRITING them!). Because of his obsession and brilliance, he currently isn’t interested in joining the rest of the world. Without turning this into an unschooling article, there is a certain degree of “deschooling” a child will go through when first realizing they are not being forced to memorize things they have no interest in. Picture having been restricted from a certain food group for years and years and suddenly you are told you can eat whatever you want WHENEVER you want – what do you think you would do? Eat all your favorite foods to excess, most likely! Then your body would realize it could have them at any time, and the pendulum would start forming a natural balance – you would find a nice rhythm to your eating. By the way, your body is way smarter than your fad diet, but that’s a post for another day! Sure, his body is taking care of the regulation of this energy, but not in a productive way. Typically this will result in dogs or sister lashing out at him for inappropriate agitation, followed by the lowering of his self-esteem because he doesn’t understand what everyone’s so upset about. Short chunks of regular movement breaks. One of my greatest motivation tools for Justin is a timer. Whenever he is resistant to any activity (tooth brushing, taking out the trash) I turn it around and make it a game. I tell him he’s not faster than me, and we have a friendly race doing whatever it is that needs to be done. So we will set a timer and perform animal crawls, star jumps, and similar short bursts of full body movements. Functional exercises for short periods of time are great for everyone, not just children on the Autism Spectrum! Family field day. Sandbell tossing, hurdles, jumps, even sack races… there is nothing wrong with a little family competition! We’ll even get the dogs involved (Malamutes LOVE to pull things!). I am making the ribbons tomorrow – very excited! Replace the mini trampoline. It’s been a while since our old one broke. Why have I never replaced it? This is a good object to always have available to alleviate any short bursts that come unexpectedly. Weekly yoga. There are so many benefits to practicing yoga, especially for Autism. We both loved doing this in the past – once again it’s funny how bad habits seem to have much easier “sticking” power than things that are good for us! Exploring new parks. We are very fortunate to live in a county that has over 120 parks and recreation centers. Why are we sitting at home? Time to say no to some of those freelance clients that need things yesterday, turn off Law & Order (love me some Vincent D’Onofrio! ), put the iPhone on airplane mode and go PLAY. We can even make a park rating document and map – why not turn it into “research”? How does regular movement really help? Fitness boosts confidence, independence, and self-esteem, plus it teaches goal setting. Speech targets, communication, and behavioral targets can also be incorporated into your daily movement breaks. Remember, no expensive, large equipment is needed! This is my Spring commitment to my children and myself. I set an example daily with the intense early morning workouts I do at home; however they never see me simply moving for fun, other than walking the dogs. Join me in this Spring movement… “movement”. Remember, sharing this goal with your child will benefi­t the entire family – it sets everyone up for long-term health and fi­tness. Tell me how you plan to move more with your child by commenting below or sharing it on the SOA Facebook page! I love fresh ideas! Brrr! The weather’s starting to get chilly (I hear it’s actually snowing in places other than Georgia… color me jealous!). The kids are spending more time inside – where does that leave fitness and movement? Let me tell you what happens in our house if we don’t find a way to burn off that energy: bedtime somehow gets prolonged. A whirling dervish races up and down the hallway whilst screaming in a pitch heard by dogs in the next state. My son repeatedly tries to ride the puppy. Lots of crashing into walls. Frustrated family members grow impatient. Invisi-ball. This is a great game for imagination and it saves fragile knickknacks to boot! I start by choosing an imaginary ball – any size – and tossing it to my son. As we catch or volley throughout the game, either of us can change the ball type at any time to keep it interesting. We throw invisible beach balls, softballs, and everything in between. It’s fun to let some hit me in the head and knock me down, miss some. and catch some impossible ones! Animal relay. This is fun if you have a long stretch of room to travel. Each turn is performed as a different animal: crab walks, frog hops, bear crawls, etc. You can either race your child or tag team the animals and take turns. Runaway bug. If it doesn’t creep out your child (or as I used to say when I lived in New York: “skeeve” him) pretend a giant bug just crawled up his leg. Each body part the bug travels to is the part that gets the wiggles and the only part the child can move. The game ends with free-play movement – shaking the bug off your whole body. Yoga ball rolls. I bought a giant yoga ball with some exercise infomercial system years ago and it is probably one of the most used items in my house to this day. For me, it’s an intense addition to my bodyweight and interval training. For my daughter, it was a giant dinosaur egg when she was younger. For my son, it’s an awesome sensory experience. There is no wrong way to roll around with this versatile piece of equipment. Obstacle Course. Indoor obstacle courses do not have to feature running around cones and climbing walls; there are many tame ways to enjoy a friendly competition inside. Stepping over items and crawling under chairs are just two ways a course can be manageable and still fun. If you have any party streamers leftover from a past celebration, be sure to tape it across a doorway for the final destination of the course. Who doesn’t like running through a finish line and tearing the ribbon? Dyna-Band pulls. These can be used as a tug of war exercise with your child, or draped over a doorway to do some challenging yet fun pulls. My son likes the feeling of things wrapped around his neck, so I always have to be extra present and aware when we bring out the Dyna-Bands. This is not something he can play with unsupervised. Yoga. Yoga is great for relaxation but also offers much in the way of movement. My son never wants to do yoga with me when I ask him. Yet, every single time, I’ve sat next next to him in his room and just started some poses. I show him pictures of someone doing a yoga pose and ask him how to do it, pretending I simply don’t understand. Before I know it, he not only shows me the pose and joyfully does it with me, he asks for more! Yoga is fun, as long as you adapt it to your child’s abilities. Bathroom experience: his body now signals that he has to go – no more accidents (thank you! ); it is an easier experience – 15 minutes in the bathroom instead of 45! He is aware of possible consequences before proprioceptive crashing – Justin will now run up to things and stop and think first about whether or not it might be a good idea. He redirects himself for the first time. Empathy, remorse – he consciously apologizes after accidentally hurting someone and doesn’t repeat action! Fine motor improvement – he is better able to dress himself; he even wore jeans for the first time and buttoned them with no assistance! Initiating affection – this is a biggie! He is equating more with people and less with things. Expressing more frustration – this is due to experiencing certain feelings for the first time. Listening Training has begun the process of allowing him to be receptive to and in touch with his emotions. Justin will need to now learn how process those appropriately. Although this may appear to be a regression in behavior, I realize that Justin is experiencing a reorganization of how he sees the world and processes information. It’s going to take time for these changes to be integrated into daily practice. I have to dig a little deeper. Some of these behaviors are not necessarily a regression, rather familiar ways of coping with new feelings and experiences. He is also reflecting his new feelings of frustration through verbal stimming and needs to learn new and appropriate ways of expressing them. The next intensive will continue to address sound sensitivity as well as introduce organizational skills and theory of mind. It is easy to focus on the behaviors we don’t want from our child when we see them, and immediately assume things are headed south once again. I don’t know about you, but raising a child with Autism is a roller coaster ride full of gains and regressions. It’s part of the process and I wouldn’t have it any other way. Looking at this progress now on paper, he truly has made some incredible gains. It is imperative that the school and I continue to support him with reward systems, redirection, and behavior alternatives as he learns to integrate information in a new way. Early on in my son’s diagnosis, we were on the six-to-nine month waiting list for Occupational Therapy at one of the top sensory centers here in Atlanta. After struggling through many public school behavioral disaster situations whilst on that list, we finally had a shot at getting into therapy… only to find out that my insurance didn’t cover it. Almost five years ago I embarked on a journey to really understand what my child was experiencing, how it compared and contrasted what other children experienced, all the components involved in the big picture, and what I could do at home to help him. You hear me talk about the importance of fitness, but that doesn’t necessarily mean push ups, squats, and boot camp for your kids! There are so many fun ways to get your children moving, and the ripple effect of this effort can be seen immediately. I personally struggle to keep my child wholly on a Gluten Free Casein Free diet. I’m simply not in a place where I can keep it up 100%, but I haven’t given up! Regardless, there are so many baby steps that can be taken to help improve nutrition. Gradual replacements for gluten and casein products include Almond or Rice milk, coconut milk ice cream, and gluten-free cereals and bars. But if you look at the bigger picture, start by eliminating or decreasing fast food, heavily processed foods, soft drinks, and excessive sweets. Also look at foods with chemical dyes. This is no easy task, I assure you! But anything you can do is better than not doing anything. I also started recently bridging the gap with whole food gummies, which give him 17 fruits, vegetables, and grains. This product made sense to me for both my children, who do not get everything they need from their limited diets, and I am SO GRATEFUL to have found it! There are TONS of things you can do at home without expensive sensory equipment or a huge gym! Some of our favorite activities include rolling on a yoga ball ($25 at Target… and I use it for my own workouts, too! ), body wrapping in a blanket, wearing double and triple shirts, and pushing heavy objects. We also like to play with bubbles, shaving cream, sand, wearing a blindfold and smelling scented oils and other distinct household foods, music time, and crawling through homemade forts and tunnels. It is also helpful to put on sounds of nature, classical music, or meditation and chanting CDs during sensory time. This is SO important! Take it from someone who frequently would let herself get depleted and have nothing left to give. Parents, make sure you are getting support and feeding yourself with what you need to enjoy and replenish your spirit! You are of no good to your family or anyone when you are drained. We can also get so caught up in the world of Autism that we forget the siblings. They need our support, too! It is essential to keep the lines of communication open with your entire family, and give them permission to feel what they are feeling. If you can, arrange for special activities and extra one-on-one time with your Neurotypical child. And get them involved! I sometimes ask my daughter’s input on how to deal with certain behaviors or feelings. Together, we come up with “emergency plans” in anticipation of meltdowns in public places, so we feel prepared for outings. I am thrilled to see all the amazing alternative therapies popping up for our children! I see music therapy, art therapy, martial arts for special needs, theatre improv groups, animal therapy, and more! Bravo! Without getting too woo-woo, there are also options to supplement your efforts with energy work such as Reiki, EFT, Pranic Healing, and even yoga. There is no magic answer to help our children, but there are so many modalities and supports available to aid us. Find one (or ones!) that resonate with you. You don’t have to feel helpless and alone if traditional therapies are not an option. I encourage you to comment on our Facebook page, Twitter, or contact me directly on this site if I can help you in any way! How Does Fitness Help My Child With Autism? I don’t know about you, but for the past four years I’ve been trying to get my child involved in an extra-curricular activity, achieving less than stellar results. At age four, even before an Autism diagnosis, I knew he had an extraordinary amount of energy to burn and his sister was in Karate. It made sense to me to get him started in the youngest group. I thought it would teach him focus and give him an outlet for some of that energy. HA! Nice try, Mom. He was kicked out in the first two minutes of his first class, and asked never to return even as a spectator for his older sis. OY! Since then, we’ve tried some easy sports, Cub Scouts, even a cooking class (an energetic child on the Autism spectrum with sharp objects… what was I thinking?!?!). It all boils down to the same issues: lack of coordination, lack of focus, too much energy, inability to be patient and wait his turn, unable to understand what is expected of him, sensory overload, gross motor deficits, and just plain behavior issues sometimes. I’ve always made allowances (and excuses) for why we can’t participate in the same things as some of his neurotypical friends do. But now he’s 8 and he still can’t ride a bike. We will be trying piano lessons (a natural gift for him), but that still doesn’t solve any of the above named issues. You ask, “Don’t they get fitness in gym class?” Not really. In fact, many schools have even CUT physical education from their curriculum due to budget cuts and increased focus on test scores! And sports (as I’ve experienced) are really hard to participate in when you can’t master basic, foundational moves or stay on task long enough to understand what to do. Self-esteem and confidence. He sees himself being successful at the movements and courses we set up and it makes him want to try new things. He knows it’s a safe place to not quite get it right. Coordination. His balance and posture have improved greatly since we started. He used to actually lean to one side and not be able to even stand on one foot! Now look at him go! Sensory issues. His favorite fitness moves offer a wonderful sensory break from an overload or meltdown. The best part? Most of them can be done in a small space using just his body weight! Attending. He can now stay focused longer when asked to do something, including waiting his turn! He’s far from perfect, but my motto is progress not perfection. Goal setting. He finally understands the process of being unable to complete something and how practice leads to the mastering of a skill. This is huge! Independence. He now takes pride in setting up his own mini obstacle course for us to do together. He can even create one for his peers to try! Contact me to find out how I can also help your child succeed using Fitness 4 Autism! It’s really fun for the entire family! Mmm, the Kitchen Smells Like Brownies! My son exclaimed these words recently and I almost cried. I have found that a significant number of children with Autism have a poorly developed, if not absent sense of smell. Many don’t even know how to actually sniff, they blow out of their nose instead of breathing in, even after being shown how to do it properly. I had always thought it odd that at a young age my son never seemed to remark or react to strong scents we encountered in our daily lives. I frequently went back through his older sister’s baby book, searching for any notes about smell in her developmental age milestones. While the ability to recognize scent isn’t really a milestone, I was hoping for some note or comment that I could associate with an age and compare with my son’s inability to smell. But this was different. In trying to bring a scent to his attention, the same thing would happen: no visible facial indication whatsoever that a smell registered with him, and he also blew out when I suggested he smell something I was holding in my hands. It wasn’t until much later that I connected it to his sensory processing issues. I was amazed by the realization at just how big of a role smell plays in the ability to learn, memorize, and even socialize. As with any symptoms on the spectrum, your child may exhibit an over or under sensitivity to smell. Think about this: does your child ever comment on cooking smells at home? Does he or she react to strong smells such as something burning? Or does he or she overreact and complain about smells all the time? As you will learn in the upcoming Healing the Spectrum therapy program, there is a link between a hemispheric imbalance and behavior and sensory issues. These deficits and issues can be changed. In just a few short experimental sessions, I have restored my son’s sense of smell using a simple and fun exercise twice a week. Tell your child you are going to play a fun smelling game and blindfold him or her. Gather about seven to nine strong smelling items and make sure your child cannot see them! Items that worked best for me were ground coffee, lavender essential oil, black pepper, an onion, peppermint extract, lemon juice, spicy mustard, eucalyptus, sandalwood, and fish oil. Have the child gently hold their left nostril closed and select your first item. Start by holding it about 12 inches from the child’s nose and slowly move it in until they can identify the scent. Stop once it is correctly identified or if you are as close to the nostril as you can get and it cannot be named. Make sure you take notes to mark the progress of future sessions. Repeat this with all the items. Do not be discouraged if they cannot identify the scents at this time. My own child was not able to correctly detect one item on the list for the first two sessions. I would hold an onion below his nose and he would say things like, “Candy?” It was clear that there was no presence of smell whatsoever and he was merely guessing. Repeat this exercise two times per week, varying the scents so the child doesn’t memorize them. Your first goal is for the child to correctly identify three smells in a row. Once they can identify all of them, you’ll no longer have to perform the exercise. When my son says things like, “Mmm, the kitchen smells like brownies!”, “What is that terrible smell?”, and “I think I smell a vanilla candle somewhere” I am indeed overwhelmed with emotion, because just a short time ago he was physically unable to sniff something, let alone identify it. **Note: the exercises above are geared toward a right brain deficiency, which is most common in Autistic children. Left brain deficient children will respond more favorably to sweet scents in lieu of strong ones, such as banana, cherry, chocolate, pineapple, floral scents, and citrus.